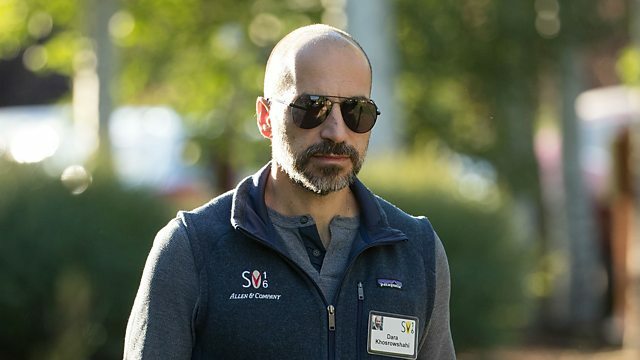 Uber is said to have chosen Expedia's Dara Khosrowshahi as its next chief executive. Uber is said to have chosen Expedia's Dara Khosrowshahi as its next chief executive. We hear about the new boss's burgeoning to-do list at Uber from Professor Sir Cary Cooper of the University of Manchester Business School. Also in the programme, as Brexit negotiators from the UK and Europe reconvene for their latest round of talks, we find out the positions of both sides. As residents of parts of the southern United States begin to deal with the aftermath of Hurricane Harvey, disaster expert Samantha Montano compares this event with previous ones. And we find out about the role of voluntary organisations in the recovery operation, from Christopher Priest of the Salvation Army. We hear from Kenya, which has just introduced by far the world's toughest laws on plastic bag use. Plus we have a report on the engineers gathered in California to try and make the 'Hyperloop' dream of 700mph ground transportation, a reality.